I was a Senior Account Executive on the Celebrity Cruises account at Saatchi & Saatchi Advertising in their New York office. I handled all retail newspaper insertions and consumer magazines and assisted with trade advertising, radio ads and production of a television commercial. I was the liaison between the creative team, our account team, media planners, trafficking, and our client in Miami, Florida. 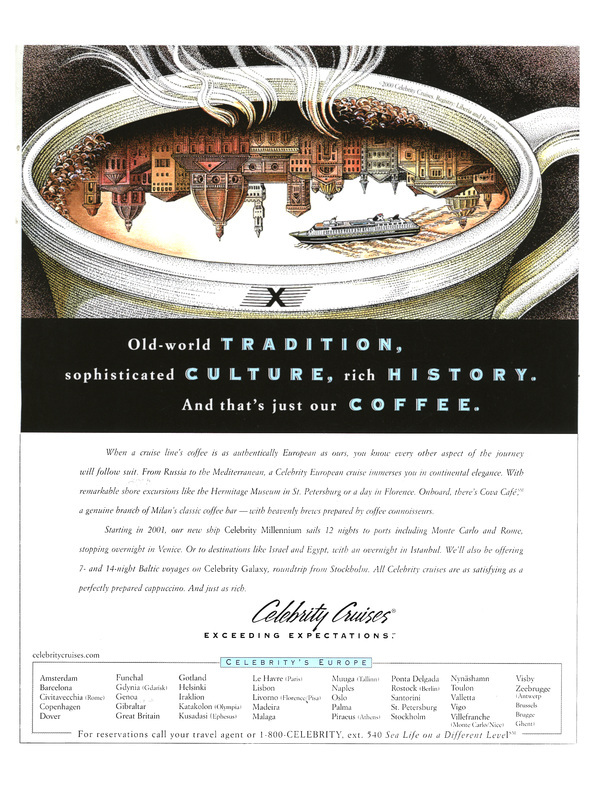 A ship is sailing on a cup of European-style coffee, reflecting majestic European buildings, conjuring up images of comfort, relaxation, serenity and rich cultural traditions (Europe). One of Celebrity Cruises' major selling points is its high-quality food. 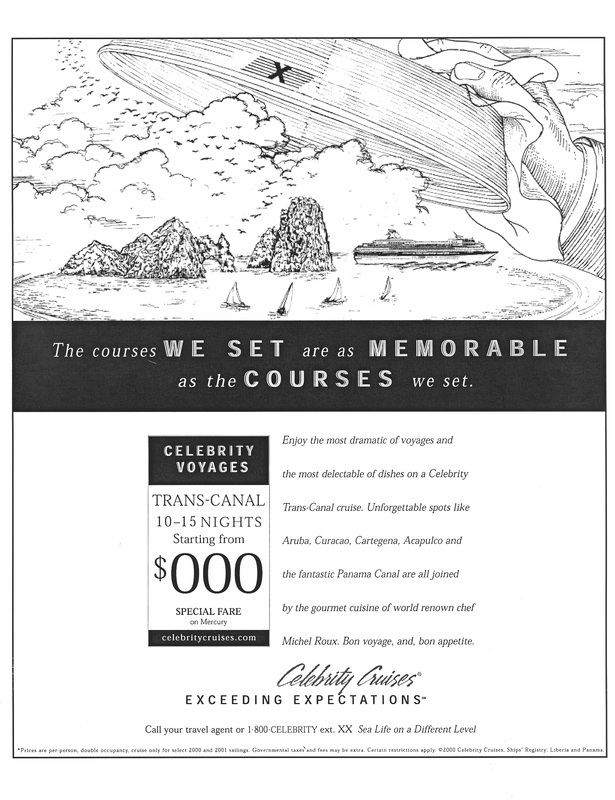 This newspaper ad entices the reader to take a Celebrity cruise because of the superior dining experience offered onboard. "The courses we set are as memorable as the courses we set." "Enjoy the most dramatic of voyages and the most delectable of dishes on a Celebrity Trans-Canal cruise. Unforgettable spots like Aruba, Curacao, Cartagena, Acapulco and the fantastic Panama Canal are all joined by the gourmet cuisine of world-renowned chef Michel Roux. Bon voyage - and bon appetite." This is an example of a co-op advertisement. Sears Travel Service paid 25% of the advertising insertion costs and as a result, were able to add their logo onto our professionally designed ads. The additional funds that were generated allowed Celebrity to place more ads elsewhere and small travel agencies, which couldn't afford the large space and professionally-designed advertisements, were able to partner with Celebrity and claim the ads as their own. This created a win-win situation for both Celebrity and their travel partners. It also ensured that any advertising by travel agencies promoted the Celebrity brand in a professional manner and consistent with the image they wanted to portray. "20 beautiful islands...26 different martinis....Mix well and enjoy." "First, choose from the most enchanting Caribbean destinations. Like St. Croix, Martinique, Curacao, Grand Cayman, Aruba and many more. Then, add in the most lavish martini bar at sea and you have the perfectly prepared vacation. Served only aboard a Celebrity cruise." 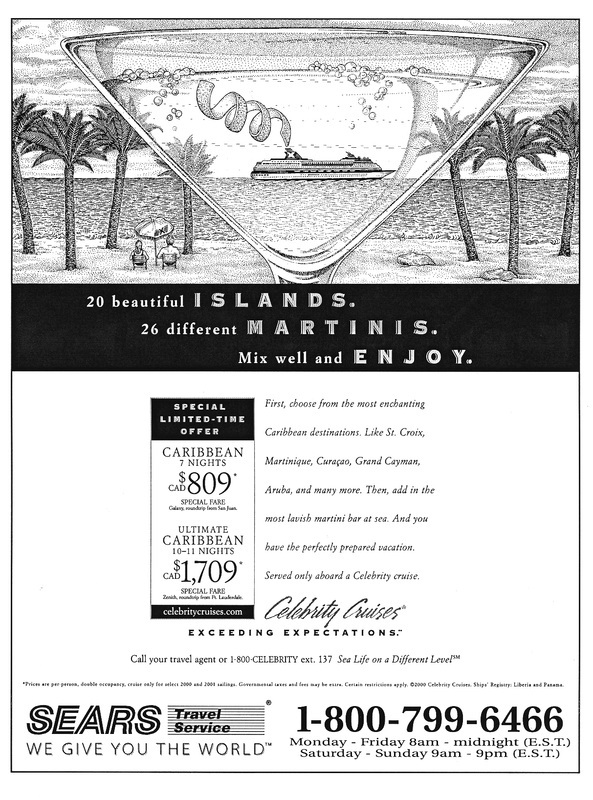 This is an example of a 4-color consumer ad that was placed in travel publications including Conde Nast Traveler and National Geographic Traveler. More expensive cruises, such as Europe, were placed in these types of publications (without prices), where the demographic of readers indicated a higher disposable income. "Old-world tradition, sophisticated culture, rich history. And that's just our coffee." "When a cruise line's coffee is as authentically European as ours, you know every other aspect of the journey will follow suit. From Russia to the Mediterranean, a Celebrity European cruise immerses you in continental elegance. With remarkable shore excursions like the Hermitage Museum in St. Petersburg or a day in Florence. Onboard there's Cova Café, a genuine branch of Milan's classic coffee bar - with heavenly brews prepared by coffee connoisseurs. ....All Celebrity cruises are as satisfying as a perfectly prepared cappuccino. And just as rich."